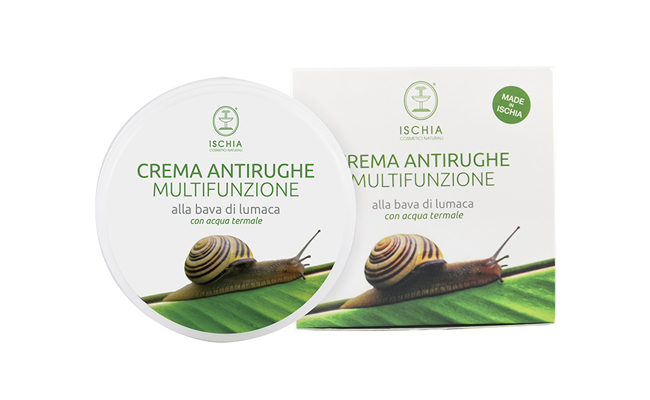 MULTI-PURPOSE ANTI-WRINKLE CREAM WITH SNAIL SLIME, designed to reduce the facial signs of expression, nourishes and hydrates the skin with its combination of allantoin, elastin, collagen, glycolic acid, vitamins, and essential amino acids, which are all ingredients of the snail slime. Nourishing action: About 80% of the skin consists of elastin and collagen fibres. Thanks to the action of the snail slime, the tissues become more elastic and toned. Regenerating action: The allantoin slows down the process of skin ageing, and simultaneously stimulates the production of elastin and collagen fibres. Exfoliating action: The glycolic acid performs a delicate peeling of the surface of the skin, and helps with the treatment of skin dyschromia (age spots). Hydrating action: Thanks to the proteins contained in the snail slime, the tissues are oxygenated and hydrated. Antioxidant action: Vitamins C and E have the ability to reduce inflammations and fight free radicals. Apply on a clean face, preferably two times a day, morning and evening. To help with scar tissue or age spots, it is recommended to apply the product three times a day.